Hardwood flooring has truly lasted the different trends throughout the years. 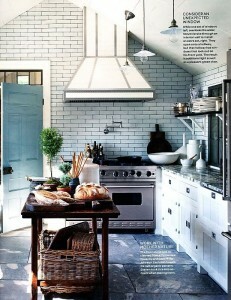 You can use this type of flooring and create looks such as modern, classic, rustic, and many more. Hardwood flooring has always been a classic flooring choice, and the best part about this flooring type is all of the new finishes and types of hardwood in the market. A good quality cabin grade wood will produce a good-looking floor, but it will be more rustic and have more character than better grades of wood. In other words, it will have more light and dark boards, more mineral streaks, pin holes, and small knots holes. When purchasing cabin grade wood, you will need to purchase 15% extra material than the square footage you are covering. All of the three different hardwood types come in a variety of finishes. 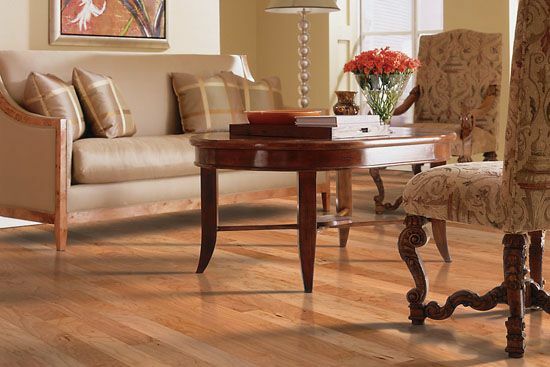 Hardwood with a traditional finish has a smooth, classic look. Planks with a hand-scraped finish have a hand-hewn finish that gives the product extra texture and character. Hardwood flooring with a distressed finish has more of an aged or vintage look. The products also look a bit more marked up than hand-scraped planks. 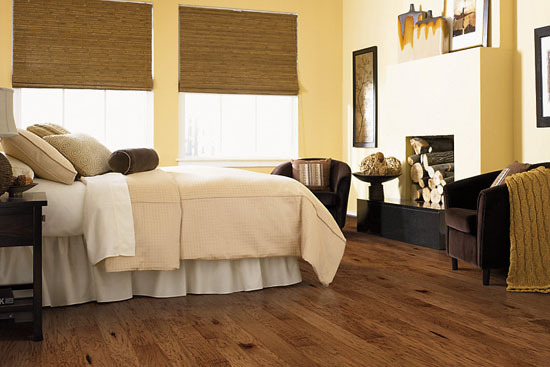 Check out all of our hardwood flooring collections. Currently, Carpet Express has some great cabin/tavern grade hardwood specials in stock. 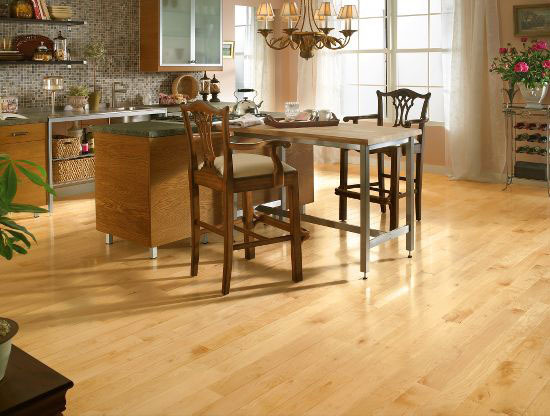 The hardwood is available in four species: hickory, maple, oak, and red oak. Cabin/tavern grade hardwood does have more character to the planks and short boards, but at the great prices it’s no big deal to get the extra 15% of product to complete the flooring. Click here to see our selection of cabin/tavern grade hardwood. Yesterday, we had a fun bowling event at Carpet Express. 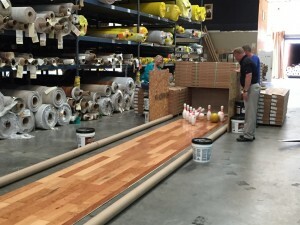 All of the employees bowled on a real bowling lane that we built in our warehouse. 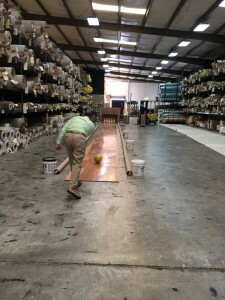 The bowling lane was created with one of our beautiful cabin grade hardwoods. The hardwood is the Turlington Lock&Fold 5″ Cherry from Bruce Hardwood. 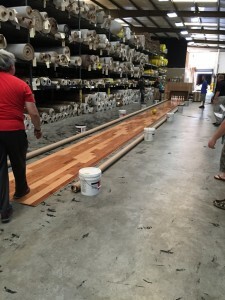 The hardwood used for the actual lane is cabin grade quality and in the color natural. We keep stock in the cabin grade quality of this hardwood, but we also have the first quality on our website. Turlington Lock&Fold 5″ Cherry, color natural, has been sold and installed in many of our customers’ homes. If you are interested in having this hardwood flooring in your home or business, please call one of our sales representatives at 1-800-922-5582 or leave a comment down below and we will get back to you. Click here to see the Turlington Lock&Fold 5″ Cherry, color natural. 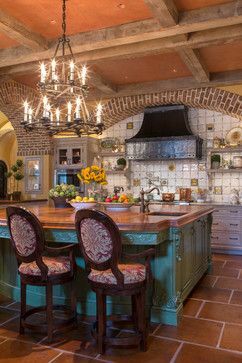 One of our boards has a lot of great ideas on how to create a Traditional style in many different rooms of a house. You can use many different types of flooring and color schemes to help create a Traditional design. Hardwood flooring, luxury vinyl tile, carpet, and ceramic tile are the most popular choice for a Traditional design, but you can use whatever flooring works best with your room design. 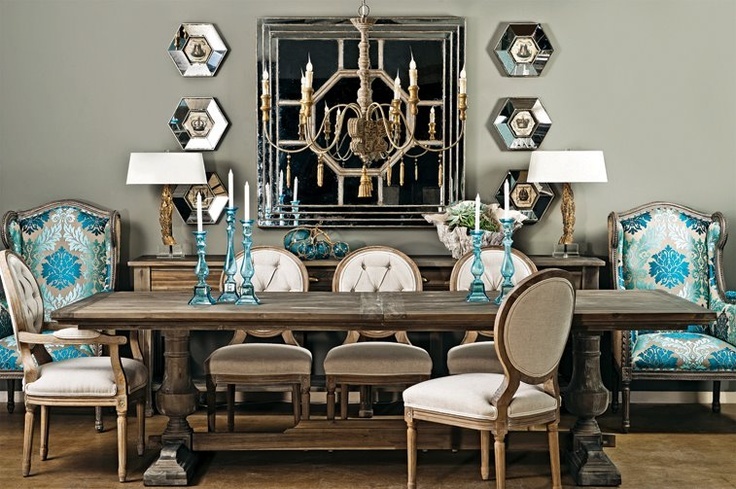 Click here to see our Traditional interior design Pinterest board. 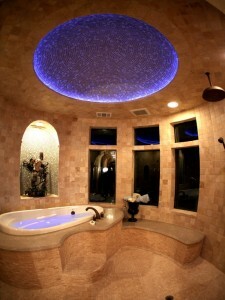 Click here to see our ceramic tile flooring. We would love to hear about how you would create a traditional design in your home, and if you already have a traditional design, we would love to see pictures. 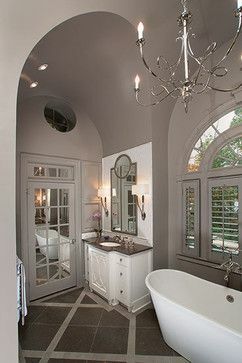 Grey is a popular color for 2015, and the best part is that there are many variations of the color grey. One of the variations that is currently showing up in many interior designs and flooring is the color glacier grey. This color is a soft and cool color, which means that it will go well with other more vibrant shades. Glacier grey will contrast well with other brighter colors, and it will also enhance the other colors as well. Glacier grey is a timeless shade, and it will look beautiful in any home. Also, this color is very popular in flooring now too. Glacier grey is used as the color for carpets, laminate, hardwood, luxury vinyl tile, and even vinyl. There are many ways to use this color in your home, be creative! Click here to see our selection of luxury vinyl tile. 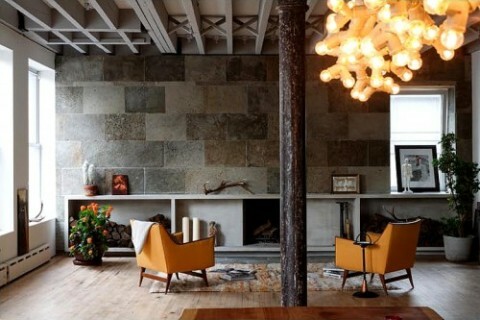 Modern Rustic is an interior design style that will be very popular this year. The style is so adaptable for many different homes. 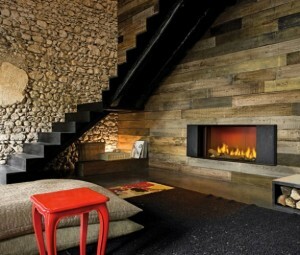 Modern Rustic blends charming rustic styles with sleek modern designs and functionality. Rustic designs have been popular for many years, and adding modern functionality will make this style stay and evolve for many years to come. The most important part of having a modern rustic space in your home is to have an open floor plan. The open floor plan will allow the rustic flooring and decor to be shown off well with the modern elements in the room. One of the main components to creating a modern rustic design is to bring the quality of natural materials such as wood and stone inside the home. 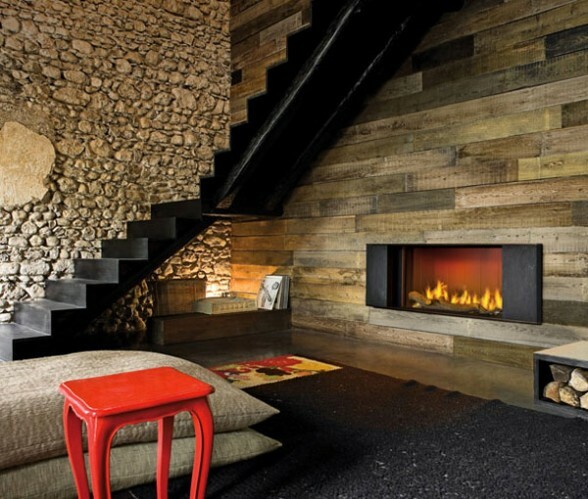 Wood panels or other natural wall coverings such as stone will create a stunning natural look to the room. If wood panels are too expensive, then there are many realistic-looking wallpapers that have wood or stone patterns. The most important feature of the room is the flooring. The floor is an essential part of making the design work. 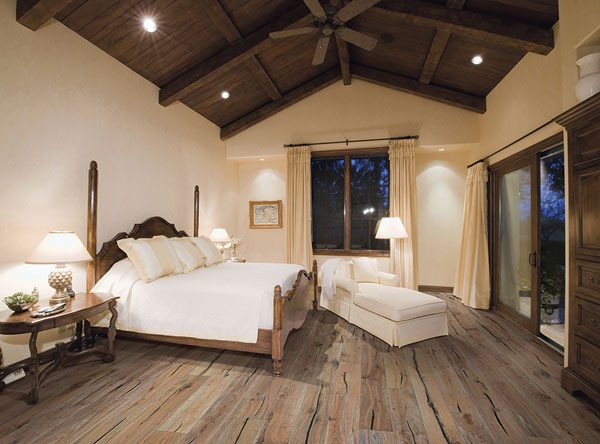 For a modern rustic look, you should use flooring that provides a strong, rustic finish that has different weathered visuals. 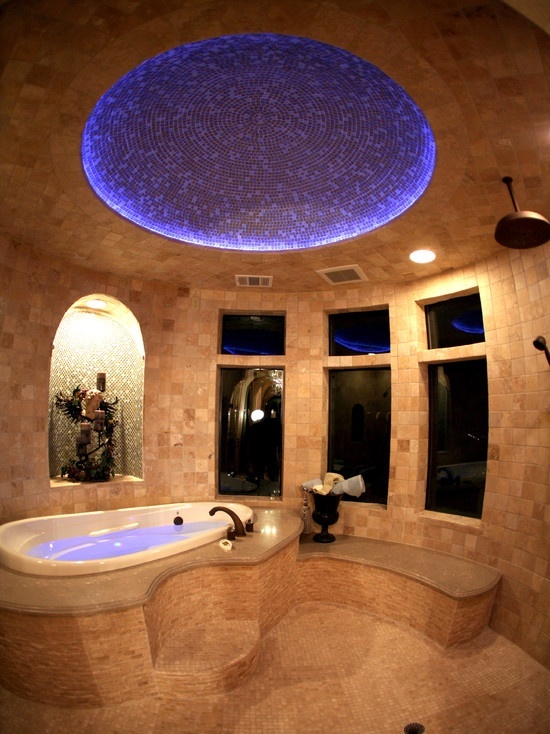 You can use stone patterned flooring or wood patterns that look weathered or aged. Vinyl, luxury vinyl tile, or hardwood will work great for this type of design. Since the flooring and walls will have a rustic theme, the furniture and appliances in the room should have a modern theme. For living rooms, use more sixties and seventies style modern, and with kitchens and dining areas, use ultramodern furniture and appliances. For a modern rustic design, you should also make sure that the upholstery and different accent pieces in the room also feature the rustic and modern aspects. 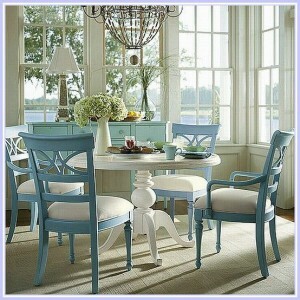 The large pieces of furniture should have a neutral tone, and the cushions should be made of natural, non-dyed fabrics. Also, the more natural light the room has, the better the design will work. 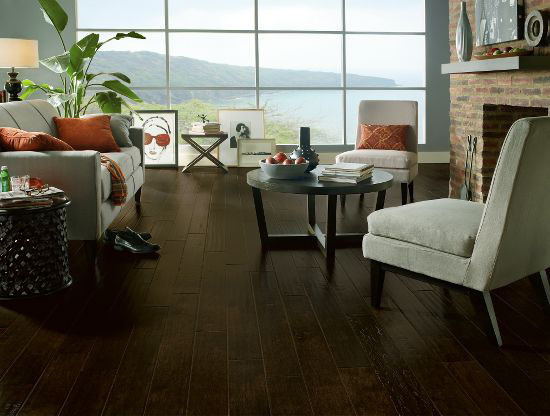 Click here to see our selection of luxury vinyl tile flooring. Click here to see our hardwood flooring. 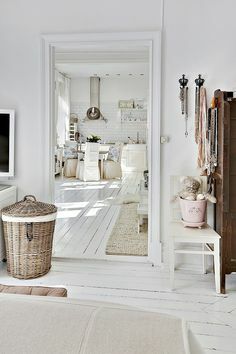 One of our boards has a lot of great ideas on how to create a Coastal Getaway style in many different rooms of a house. You can use many different types of flooring and color schemes to help create a Coastal Getaway design. 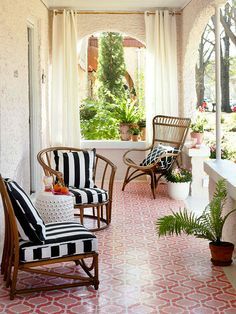 Hardwood flooring, luxury vinyl tile, and ceramic tile are the most popular choice for a Coastal Getaway design, but you can use whatever flooring works best with your room design. Click here to see our Coastal Getaway interior design Pinterest board. 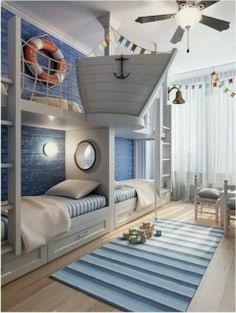 We would love to hear about how you would create a coastal getaway design in your home, and if you already have a coastal design, we would love to see pictures. One of our boards, the Mediterranean Delight, has a lot of great ideas on how to create a Mediterranean style in many different rooms of a house. You can use many different types of flooring and color schemes to help create a Mediterranean design. Hardwood flooring and tile are the most popular choices for a Mediterranean design, but you can use whatever flooring works best with your room design. 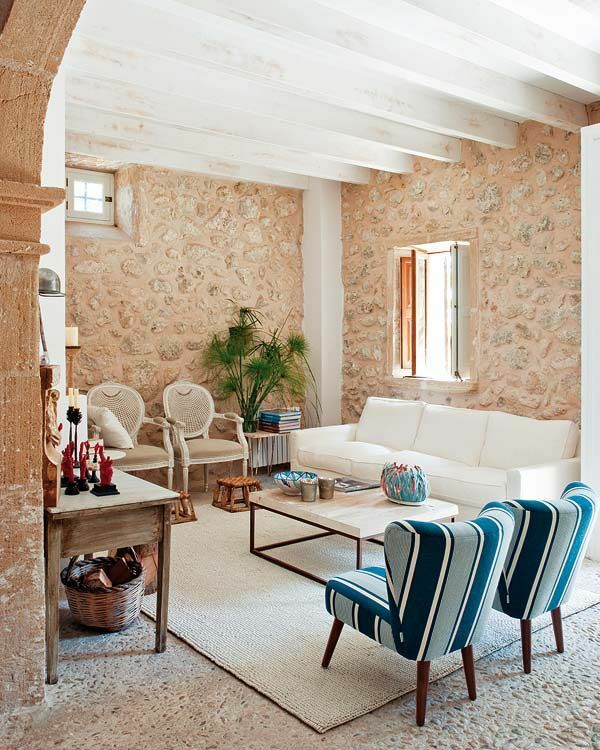 Click here to see our Mediterranean Delight interior design Pinterest board. We would love to hear about how you would create a Mediterranean design in your home, and if you already have a Mediterranean design, we would love to see pictures. “Cabin grade”or “tavern grade” wood is an excellent choice when purchasing new hardwood flooring. Cabin grade is basically the same wood as 1st quality, which means it is the same species, it is milled to the same specifications, and it is stained the same color. The only difference is that cabin grade wood was called or rejected from the 1st quality run for a variety of reasons. The most common reasons are mineral streaks and knot holes, which can give the floor a more rustic look. 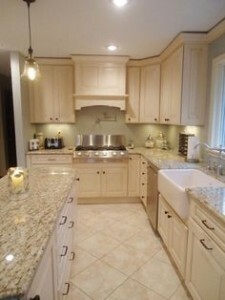 Many customers prefer this rustic look to the color consistency in many 1st quality styles. There may also be more short boards in a box of cabin grade material. 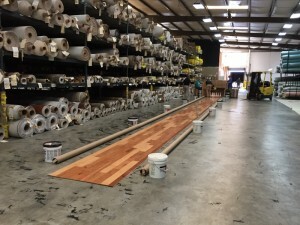 Most wood flooring is purchased in random lengths, and you will find more boards that are 9” to 18” in a box of cabin grade than you would in a typical 1st quality box. Other irregularities found in cabin grade may include missing tongues, over wood, or an uneven finish. In addition, certain manufacturers are known to have cleaner cabin grade wood than others, and they have a 5 year finish warranty on many of their cabin grade flooring. Installing cabin grade wood is more challenging, and you should purchase 15% to 20% extra material to allow your installer to use only the most uniform boards from each box. Keep in mind that cabin-grade is engineered, and when you see “tavern-grade” it means it is solid hardwood. Click here to see our selection of cabin grade hardwood flooring. Click here to see our selection of Mohawk hardwood.